All images except Delaroche painting are copyright 2010 Jane Grey. Do not use without permission. 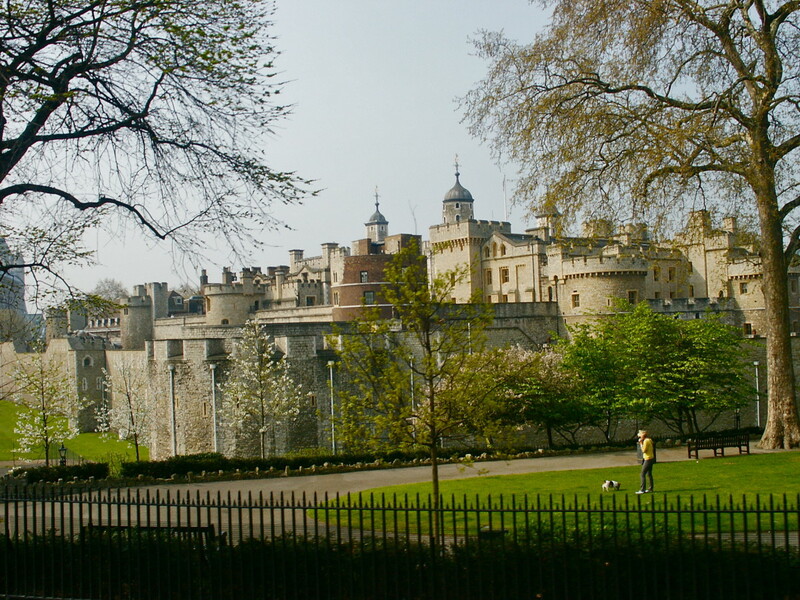 The Tower of London is at the center of nearly all of the dramatic history of London. Many facts about London's people, executions, tragedies, and tyrannies that are seemingly unconnected to each other, have intertwined themselves in this old stone fortress. What are these facts about the Tower of London, and how do they all fit together? 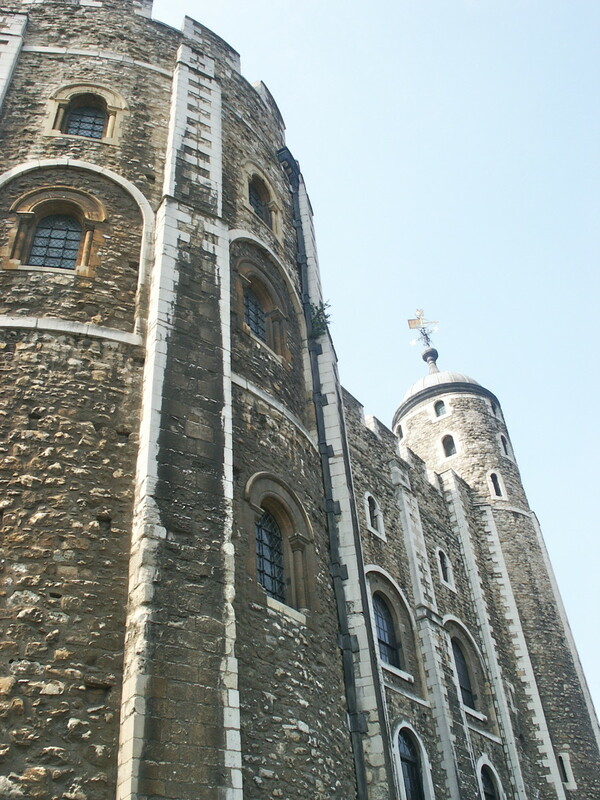 Following is a collection of my photos and facts journaling some of the most interesting details of the Tower's story. The Tower Bridge in background, Traitor's Gate entrance into the Tower of London in foreground. The White Tower, built by William the Conqueror to protect the Normans from those who lived in the surrounding villages. Standing 90 ft. high, this is the oldest portion of the Tower of London, and is identifiable by its four turrets --one of which has a circular stairway-- as well as its off-white corner "trim" in puzzle-piece brick-a-brack. 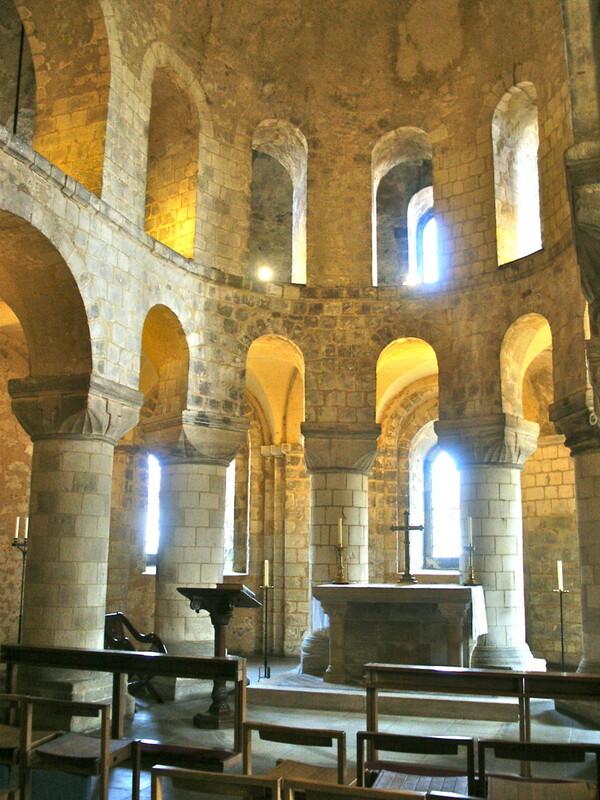 St. John's chapel is the only part of the interior of the White Tower that has retained its original appearance, and is also one of the only beautifully preserved pieces of early Norman church architecture in existence today. The Inmost Ward, which was a luxurious dwelling quarter for King Henry the Third during the early 12th century. The Inner Ward is the space within the Inner Wall that circles around and contains the White Tower and the Inmost Ward. This wall has a total of thirteen towers. 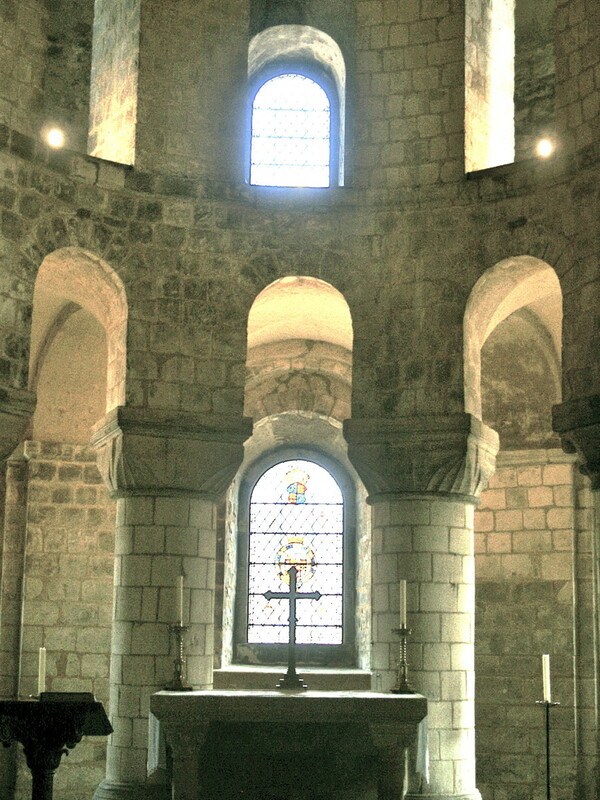 The largest of these towers, the Wakefield Tower, was the scene of the murder of King Henry the Sixth as he was praying. Other towers on this wall include Lanthorn, Salt, Broad Arrow, Constable, Martin (where the Crown Jewels were kept until 1842), Brick, Bowyer, Flint, Devereux, Beauchamp, Bell (which is the oldest tower), and the Bloody (or Garden) Tower. The Outer Ward is the space between the Inner Ward and the final outside wall (before the now dry moat). 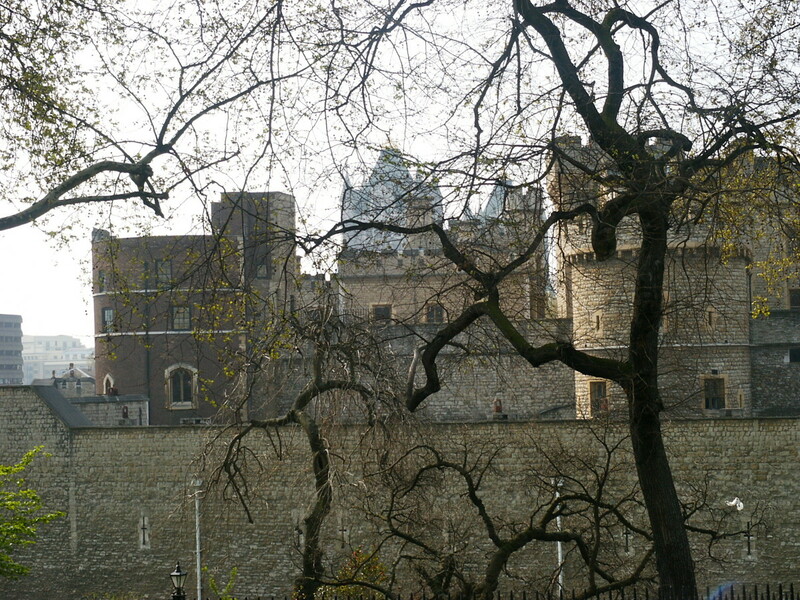 The Outer Wall completely contains the Inner Wall, and has five towers on it, all of which face the River Thames (Byward Tower, St. Thomas's Tower, Cradle Tower, Well Tower, and Develin Tower). 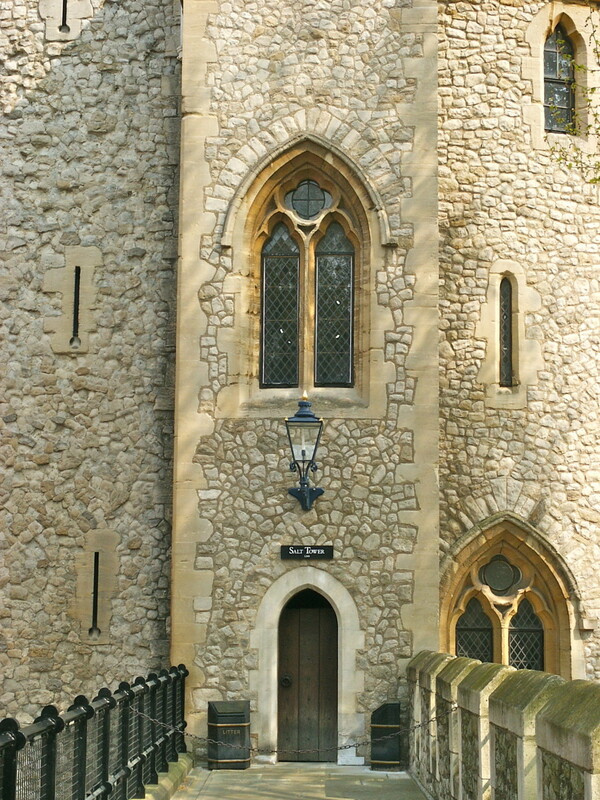 The Jewel House is the well guarded residence of the Crown Jewels and many other valuable treasures of historical and royal importance. You'll want to step inside and view the glittering diadems if you have the time! 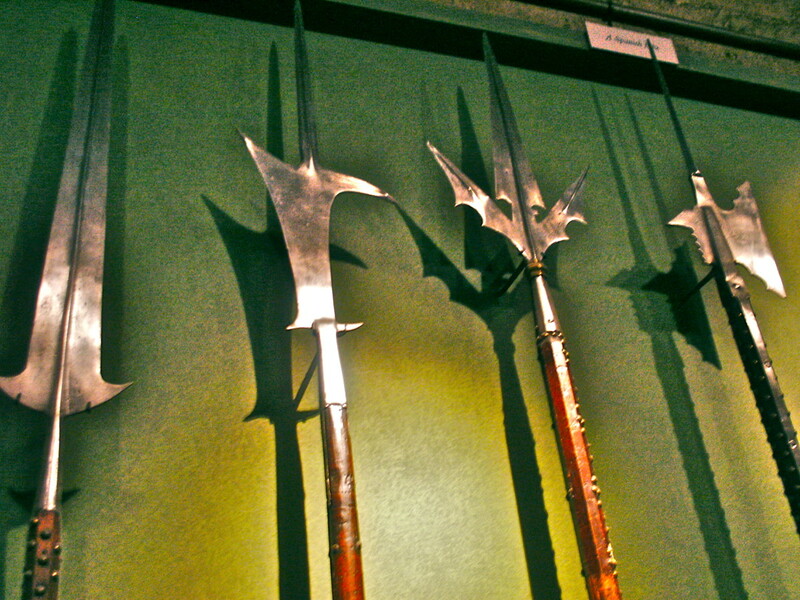 The Royal Armories contain a large collection of (mostly Tudor) arms and armor, beautifully etched and fitted. 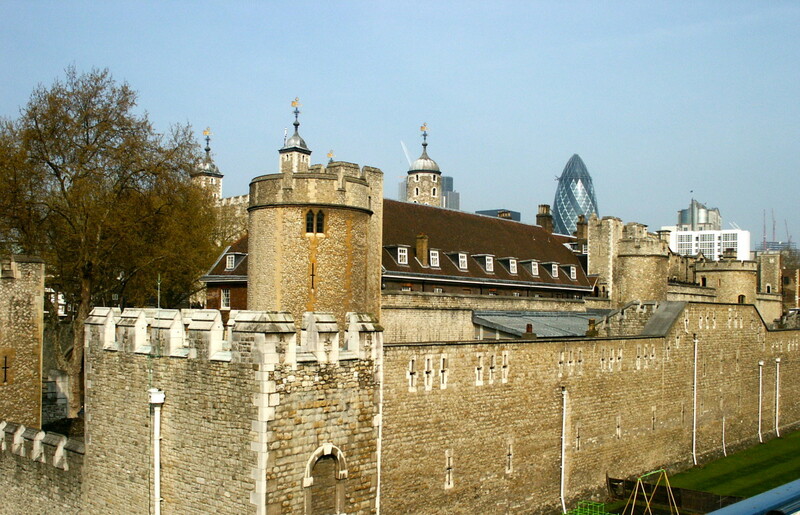 The Torture Chambers were in the "basement" of the Tower's inner courtyard, under the court green. Now they have been turned into gift shops, but it is not hard to imagine the dank and earthy smell of the Tower of London torture chambers under the bright lawn. 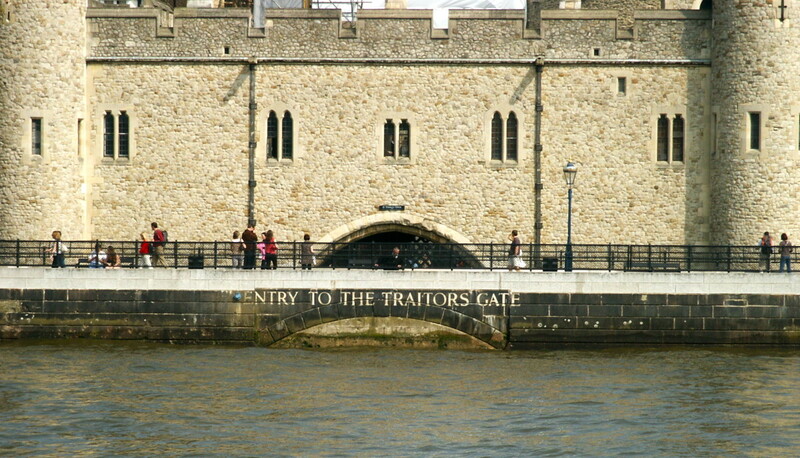 The Traitor's Gate is a low and barred entrance on the Thames River by which they rowed "traitors" (prisoners) into the fortress. 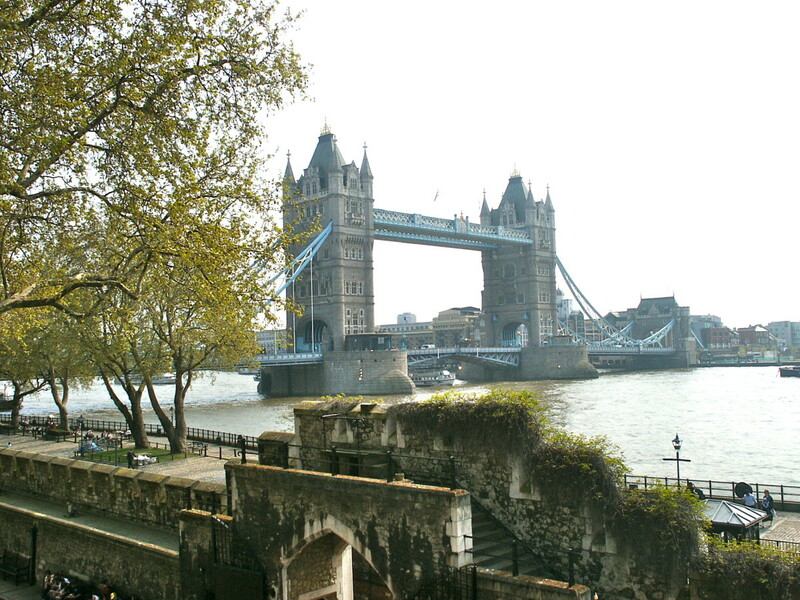 The Tower Bridge starts at the Tower of London and crosses the Thames River. The White Tower rising above and behind the Outer Wall, visible from the Thames River. Below this Outer Wall is the dry moat. 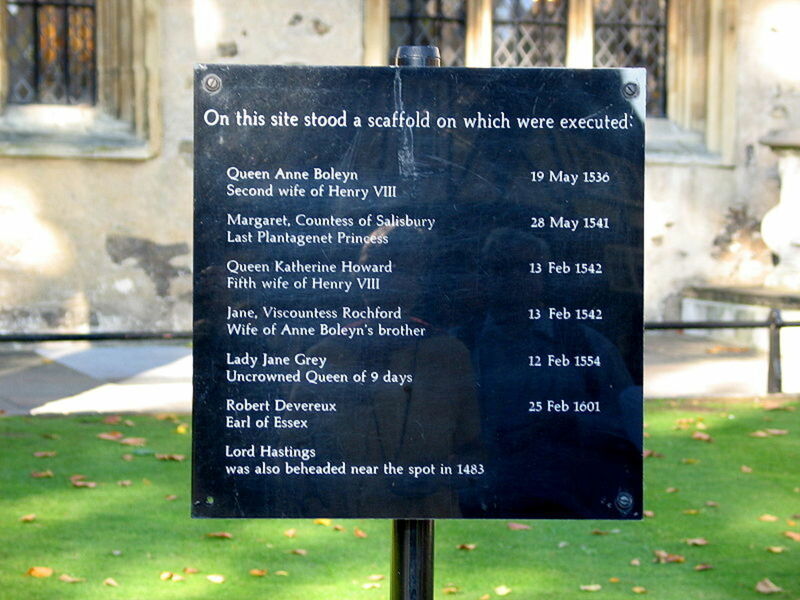 The most memorable Tower prisoner was Queen Anne Boleyn, wife of King Henry the Eighth. He decided he did not want her anymore because she could not give him the boy heir he desired. To divorce her, he accused Anne of adultery with one of his courtiers. Most accounts agree that Anne was innocent, but King Henry imprisoned and executed Anne anyway. The evidence of this was far below the just requirement of the testimony of one or two witnesses: a handkerchief dropped by Anne at a festival was picked up by a servant of the king, kissed reverently, and handed back to Anne. The king decided this was proof of adultery, and Anne was executed. The most tragic Tower victim was the Protestant Lady Jane Grey. This story tells of another tyrannical, selfish monarch, Queen "Bloody" Mary, the first daughter of King Henry the Eighth, mentioned just before. Bloody Mary had just ascended the throne in spite of the former king's request that Lady Jane take the throne after him. The former king was the only son of King Henry, a boy king of a weak and sickly constitution but with Protestant loyalties. For nine days, Lady Jane Grey was considered Queen of England, but before her ascension to the throne, however, Mary had rallied enough supporters around her to convince Parliament to declare herself the Queen. The result was Mary sending Lady Jane Grey to the Tower, though Lady Jane had no intention of fighting for the disputed throne and would have much rather led a quiet life than be queen at all. 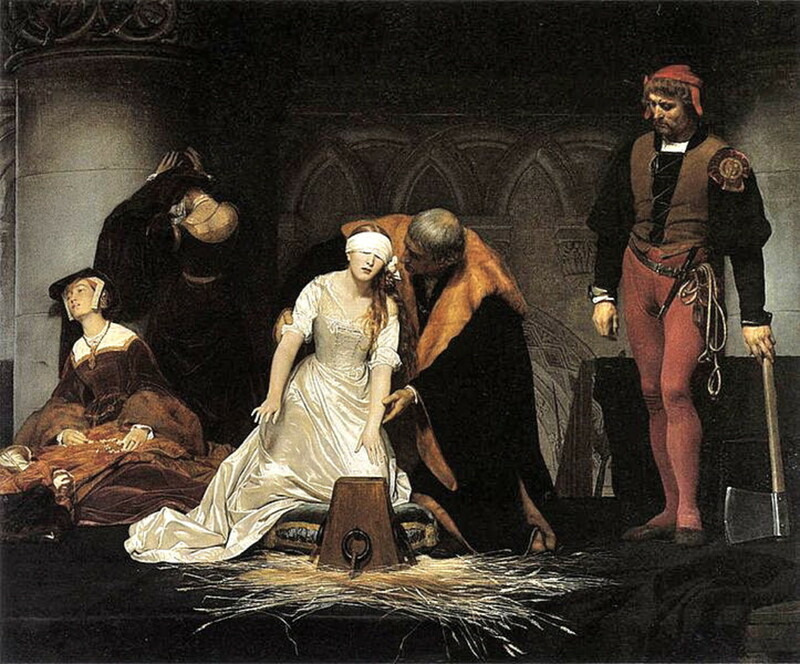 Lady Jane Grey, a highly educated, devout Protestant Christian and innocent of all designs for the throne, was executed by beheading soon after. Gruffydd ap Llywelyn Fawr, a Welsh Prince, who fell to his death from his prison in the Tower. The Duke of Orléans, Charles I de Valois, who was an accomplished writer of 500 poems, all composed during his 25 year captivity after his part in the Battle of Agincourt. King David II and John Balliol of Scotland. Thomas More, executed and buried at the Tower. Henry Laurens, 3rd President of America's Continental Congress. Queen Elizabeth the First, (before she became queen) was imprisoned only two months because she was falsely thought to have been involved in a rebellion. Sir Walter Raleigh, imprisoned in comfort with his wife and two children, wrote a history book and kept a garden on Tower Green. Guy Fawkes, a silly man with a silly name, was captured for his involvement in the Gunpowder Plot, confessed to it, but escaped and fell to his death from the scaffold before he could be hanged, drawn, and quartered. The last national prisoner was a Nazi German deputy leader named Rudolf Hess, held in 1941. The last prisoners to be held in the Tower of London were the Kray Twins in 1954, held for only a few days because of their refusal to report to national service. 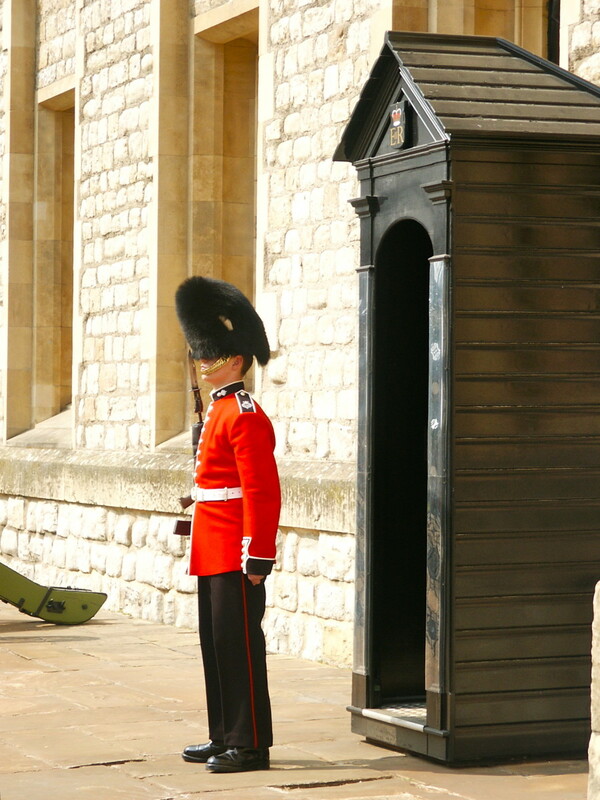 I wonder if I would get to stay in the Tower of London if I did the same thing? A Yeomen Warden on guard outside the Jewel House. 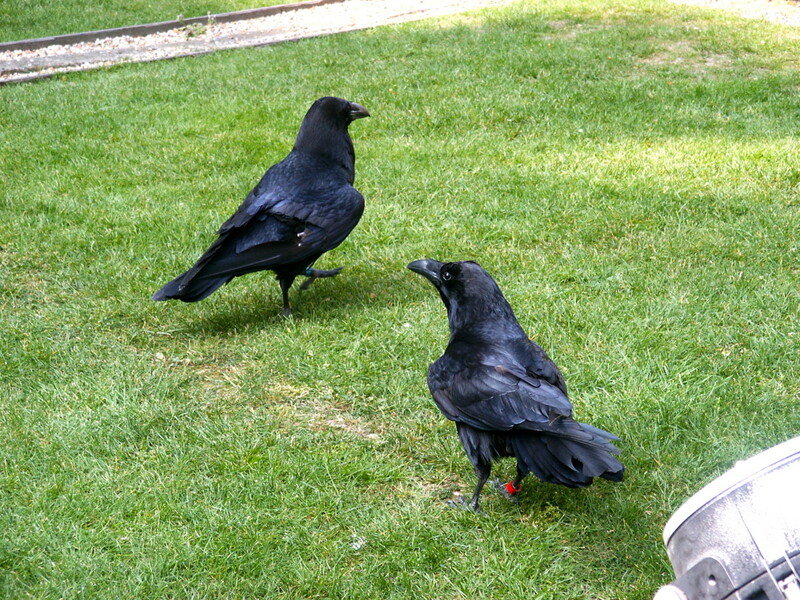 Two of the ten Tower of London ravens hop around on the lawn above the former torture chamber. The Beefeaters are more officially known as the Yeomen Wardens, and over the years their duties have ranged from guarding prisoners to guarding jewels, from escorting and guarding prisoners to escorting and guarding tourists. Their stories and gruff jokes set them apart as a tourist attraction in their own right. The name "Beefeaters" was given because the Yeomen Wardens were always handed a slab of beef as payment for their service. 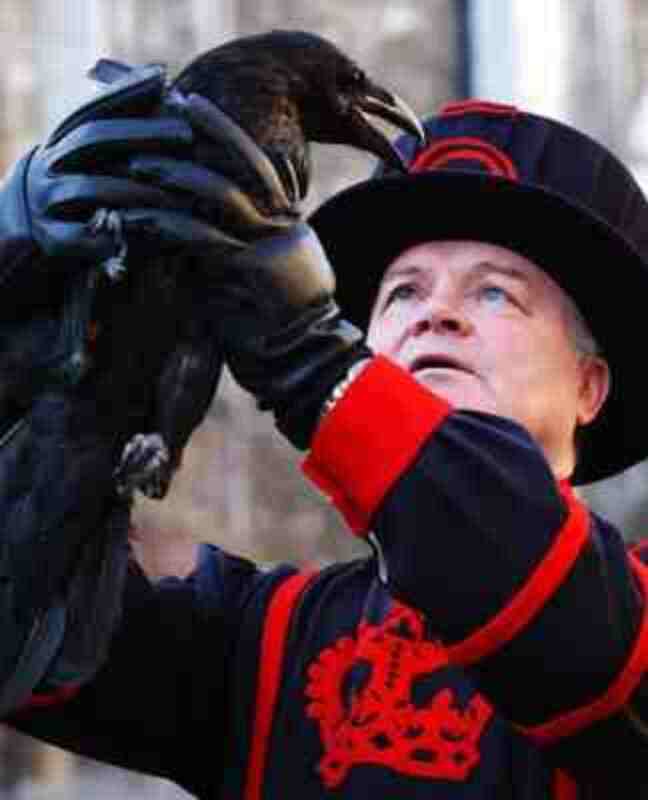 The Ravens are cared for by a designated Yeomen Warden, who builds a relationship with each raven from birth. Legend says that at least six ravens have to be kept in the Tower of London at all times, for if at any time the ravens depart from the Tower, the kingdom will fall. In all honesty, the ravens were probably originally a part of the Tower's infrastructure because of the abundance of raw or decaying flesh that the gruesome Tower housed at one time. The current ravens range from eighteen to two years old, and feed more on the scraps of fish and chips tossed out by the tourists than on anything else. Like others, I love your photos. Great hub. It made me remember our own visit there 10 years ago. It was a fascinating place. Interesting that James I of Scotland is so often left off such lists. Hello, fellow Christian! :) Glad to meet you! Jane Grey, I knew I liked you. =] I'm a Christian as well, and I wasn't scared. It takes a lot to scare me, but I felt like there were presences there -- it felt demonic. As the day wore on it was changing me, I can't explain it but it was making me angry. When I realized what was going on I went and sat out on one of the benches overlooking the Ravens there in the courtyard. It helped, but I was ready to leave. I don't know, LCaverson. It would be interesting to find out. My imagination can run away with me, but I don't remember feeling scared at the tower. I know that, as a Christian, I have nothing to fear because Christ has cast out a "spirit of fear" and given me a mental attitude of "power, love, and a sound mind." That doesn't mean that I've never felt like I've needed to get out of some place because of demonic activity-- I've definitely felt that before, and I think God gives us a sense of that so we can trust Him more and learn to flee evil. Very informative, and I loved the pictures. I've been to London and the Tower twice and can I just say, the first time I felt such an ominous feeling - there was a presence that I couldn't shake, so I couldn't wait to leave. The 2nd time was last summer, I went with several family members and I stayed away from a few of the places I had visited before, like the dungeons/torture areas and the White Tower. It seemed to make all the difference. Am I the only one who has ever had this kind of experience? Thanks, Clinton! I completely agree. 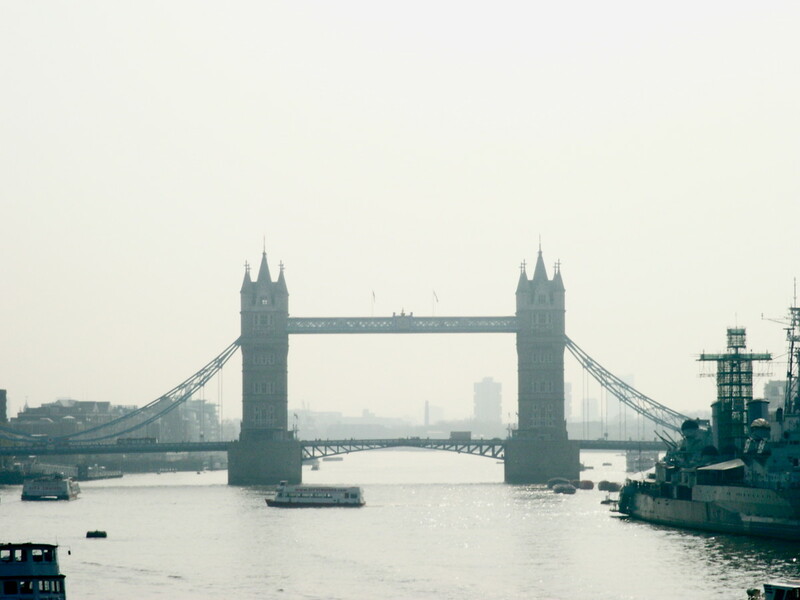 I've been to London twice as a visitor, but would love to go back again. 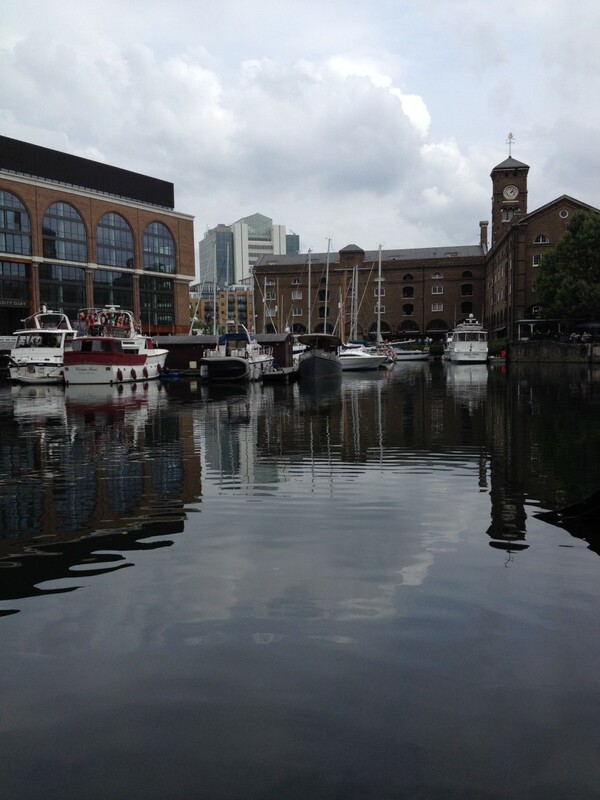 London is one city which is extremely breath-taking! good hub.. Very interesting hub. Thanks for the information! Keep it up. This web is great but needs some more info about the executions and beheading. Didn't really help me on my project but good to look at!!! It was fantastic, it helped me on a project!!!!! They had better pray to God for His forbearance and grace rather than to throw their pence into the moat for good luck! I too have heard the story about the ravens, and actually they say that if the ravens leave then London will fall, not just the tower. 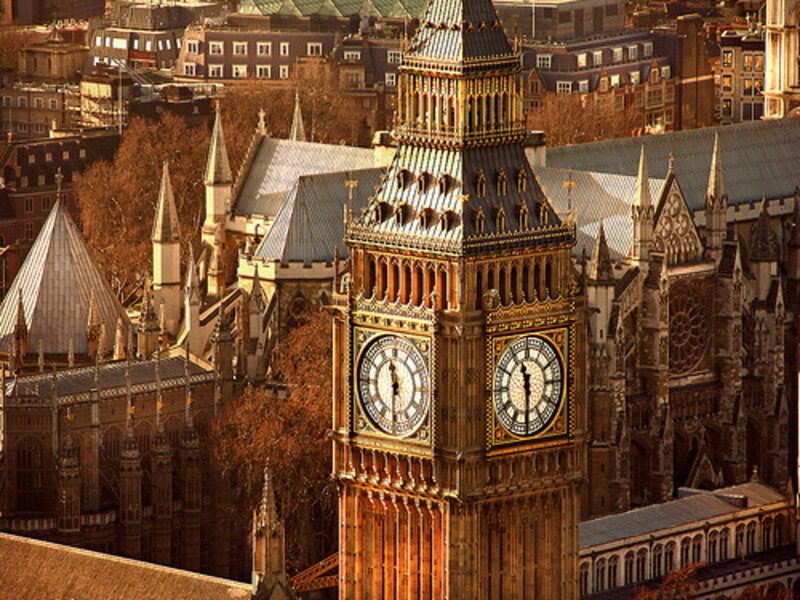 Again, God's protection is what has kept London and it's tower standing all these centuries. The facts are so intresting!!!!!!!!!!!!!! Buy the way i went to tower of london and there are bloody tower and people threw there coin like 1p or 2p for good luck so nothing happens to the tower of london . Even buy the way if the ravens fly away then the tower of london would crumble and crack and even fall apart. Cori, the facts are interspersed in the article above, where you'll find them organized by topic. let me know if there is anything else you would like to know that I did not cover! Great information and nicely taken pictures! Malcolm, I know the feeling. There's nothing like being present at the location where some of the most dramatic and culture-changing events of history took place. I was not able to look in most of the cells when I visited, but I'll be sure to look for those ancient inscriptions next time I visit. Thanks for the recommendation! fantastic hub. I've been and stood in the same room as Mary Queen of Scots! It chills the blood. The most amazing thing I can remember(I was 12 when I went) was the authentic ancient graffiti on the walls of the cells from inmates of the past. Nice Hub for those who want to know about England. Gorgeous Post. Very informative hub! Brought back the memories of my visit there. Wish I could visit this place again..
acossairt21, So glad you enjoyed this! It was a lot of fun to put together, as I loved my day at the tower of London. It's fascinating how many vital historical events came together at the Tower! I am in love with the Tower of London and really enjoyed reading this! I am a bit of a history geek and loved that you wrote about this aspect of the Tower. Thanks! MarieRyan, thanks for your visit! I am not familiar with that particular play of Shakespeare's but I can imagine how fascinating it would be to hear the Tower described or mentioned in Shakespeare's language. What a treat! Beautiful photographs and such an interesting hub. I am teaching Shakespeare's 'Richard III' at the moment. Richard sent most of his opposers to the Tower so I was fascinated by learning about all the other 'guests' who spent some time there. We'll have to travel there someday together, Rose! I did come across some "legend" that the beefeaters describe from their night watches. It involves Anne Boleyn walking around the courtyard at night carrying her head in her arms. Of course any gruesome castle that big and that famous has to have some ghost stories attached to them, but I don't believe them either! Very cool - I really want to go to the Tower someday. 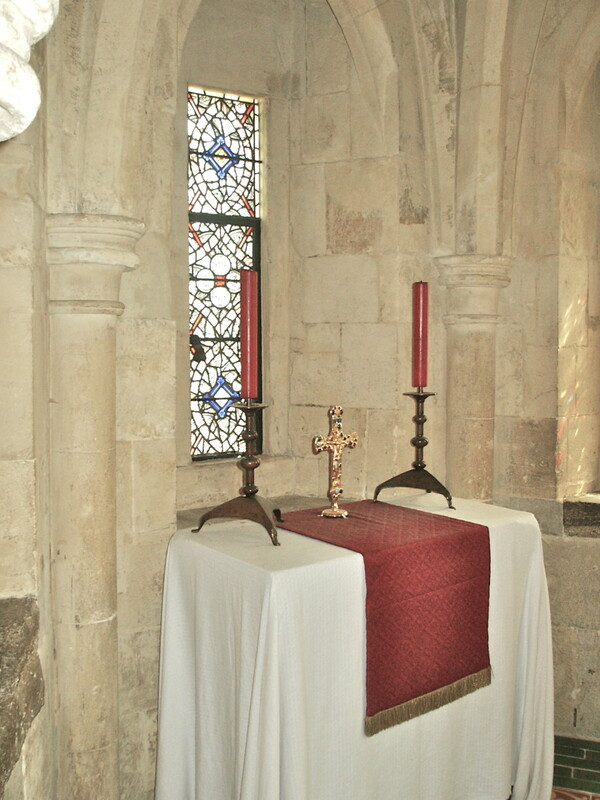 I've always been fascinated by the story of Anne Boleyn, and I've heard she haunts the Tower. Not that I believe that, but still, legend is legend. Thank you for your comment! Making money on HubPages is just like building any business: the more you put into it the more it gives you in return, and if you do it right, your articles will continue earning even if you're not producing new ones. Check out my friend Rebecca's hubs for more details and great advice on how to make your articles profitable. Her profile is: https://hubpages.com/profile/Rebecca+E. I've increased my earnings by following her suggestions. Very nice! Wonderful! p.s. How can I make money on here? Can anyone help me do this. E. Nicholson, Always special to have you stop by, and what's more, you've visited the real Tower too! I would love to go back there some time. Mike1242, Glad you enjoyed the history on the Tower! To me, that is always what makes an attraction worth visiting. He who doesn't learn history is doomed to repeat it, I will repeat my history lessons until I learn them -and writing certainly helps! DAL, Thank you for your kind complement! I'm glad it brought you some enjoyment. Paradise7, Thanks very much; and yes, this is something you won't want to miss visiting if you can help it! Thoroughly enjoyed your Hub -- the Tower is one of my favourite places to visit. So full of history. Lovely pictures. Thanks. Really need to visit the Tower, thanks for the history of the tower. Awesome hub, great pics, thank you! A real place to visit--a must-see! 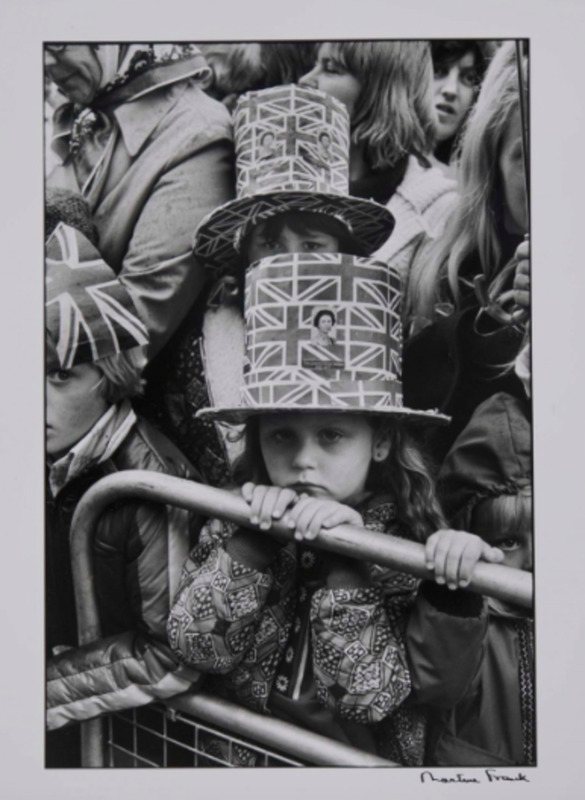 Jane Grey, a very informative and enjoyable hub with great photographs. You have put a great deal of work into this hub which makes it all the more appreciable. The Beefeaters always have quite a crowd around them! What is it about gruesome stories that attracts such a following? The Tower is certainly full of them, but it also has plenty to tell of the faithfulness of God and the testimony of His followers. Thanks for stopping by! You're welcome, Quill! I'm so pleased you enjoyed it! As always, I am glad to have your kind and encouraging complements! Thank you, TnFlash! The pictures were my favorite part to fix up and put together. I'm glad you liked them too! Great Hub! This is a very interesting Hub. The pictures are excelent. Thank you for your kind comment! I love design and fine art, and medieval architecture has always been one of my favorite things to draw and photograph. Thank you, Travelesspresso! Yes, my pen name is from Lady Jane Grey of the Tower. I have always loved her testimony of innocence as well as her stand for the truth during the Reformation. Thank you so much! I was glad for a fairly sunny day, so that really helped with getting good lighting for photos. The beefeaters were definitely unique little gentlemen, going from historic fact to ghost stories to legends to jokes! I watched Anne of the Thousand Days last year; I agree-- it was well done but very sad. I've always liked her story too, but that's probably because I don't know very much about his other wives. What I've always wondered is why these women married him, when they had to have known what he did to his other wives! So glad you liked it! I was ecstatic the whole time I was there visiting the Tower of London; I just couldn't take enough pictures! It is truly a thrilling place if you love history and stories and drama. The book you recommended sounds fascinating. I'll have to keep it in mind, because I love cathedral architecture as well. Brilliant images of crafted Architecture.You have an eye for great stuff! Nicely done Jane Grey and incredibly interesting. Is this where you name comes from? Nice job discussing the immense topic of the Tower of London. You're photos were also beautiful! The beefeaters are my favorite part! Each one had wonderful stories to tell and little anecdotes that made the tour even better! I always felt sorry for Lady Jane Grey and Anne Boleyn. I'm not sure why but Anne Boleyn was always my favorite wife out of Henry's six. Be sure to watch Anne of the Thousand Days for the best portrayal of Anne (Genevie Bujold) and Henry (Richard Burton). It's magnificent!